Bathrooms aren’t always about constant maintenance. We expect our clients to actually use their bathrooms, which is why we love to inform them of potential problems. Sometimes your trip to the bathroom is a quick “in and out” dance. And sometimes those calls of nature require a little more time. So, what do you do to pass the time while doing your business? We know your favorite thing to do is read septic maintenance articles from Advanced Septic Service but, we want to see you branch out. 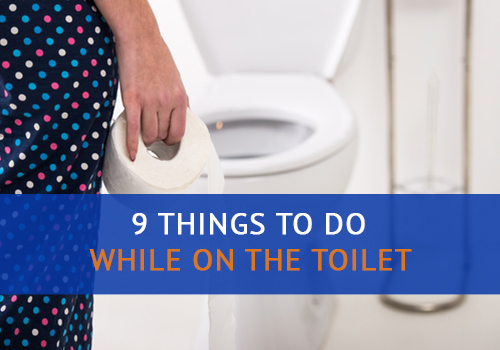 We’ve compiled a list of things to do while on the toilet to accomplish just that. Take a look (maybe while your handling your business). Everyone Poops by Taro Gomi. It’s a classic. No one’s denying that. This is an excellent reminder of what you have in common with your fellow humans and pets. What’s Your Poop Telling You? By Dr. Anish Seth and Josh Richman. Did something seem a little off during your last bathroom visit? Maybe you should pick up this book. We suggest you take a look at this if you want to understand the processes of your body. The Great American Bathroom Book (series) by Stevens W. Anderson. This series includes great reads like Lord of the Flies and The Seven Habits of Highly Effective People. Everyone will be so impressed by your knowledge at the next birthday party. Have you ever had a conversation with someone only to come up with the best witty reply the moment you left the party? Why not use this time in the bathroom to replay those moments or create imaginary conversations that could happen in the future? Do you have a hard time delivering that one punch line every time you attempt a certain joke? Use this time to practice your jokes or witty responses! They say practice makes perfect, you know we all do it. Nobody likes calling their internet or cellular provider. So, why not make these calls while sitting on the toilet? If you know you’re going to be in the bathroom for a while, you might as well make those calls you’ve been meaning to do for the past week. That’s right, we’re saying that this is the time for you to make those calls to your local CenturyLink or Comcast representative. Heck, call us! Do you have a question about your septic system and septic tank? We are over the moon to answer your septic questions! Don’t waste this valuable time. When you’re all done in the bathroom, you can wash your hands clean of these responsibilities and emerge as a new person. Pro Tip: Keep a firm hold on the phone. While we love hearing from you, by the time we get there to help remove your phone from your septic tanks it’s already a goner. Have a stack of crossword or sudoku puzzles waiting to be conquered? With all of the hustle and bustle in life, it’s hard to take enough time to think of the 9 letter word that holds your waste (septic tank, by the way). This is probably something that you already do. Take the time to check up on your social media accounts. You could be using this time to review your privacy settings or going through those photos that you may not want your new employer to see. Why not use this time on the toilet for shopping? Finding the perfect bargain takes time! Do you have a friend or family member that has a birthday soon? Were you invited to a wedding or baby shower recently? Use this time to get ahead of schedule. Don’t wait until the last moment to find that perfect gift for someone. Or, maybe your shopping for yourself. Go ahead! Treat yo’self. Buy that 3 ply toilet paper. Your tush will thank you. Be honest with yourself. How many emails do you have in your inbox right now? How many emails have you been avoiding answering? Making this a part of your regular bathroom is a great habit! In today’s technological world, everyone has a dating app on their phone. Spend this time finding the love of your life. They’re out there. You can swipe while you wipe (if you’re coordinated enough). Time is money, people. Time is money. We’re serious about your bathrooms. We want you to have a healthy relationship with your septic system and lavatory. This includes taking the boredom out of bathroom breaks. So give these things to do while on the toilet a chance. And give us a call if you have questions about the health of your septic system. You don’t even have to mute the call when you flush (although we might prefer that if we are being honest). Call us at Advanced Septic Services at (352) 242-6100. Advanced Septic Services is your Lake County, FL source for Septic Tanks, Drain Field Repair and Maintenance, Greasetrap Maintenance, Septic Pump Outs, and Septic System Inspections.